I have completed the tank setup for the yellow shrimps(query TT,YKK or yellow neos, still dont know what they are.) They are residing in a pail and are so hardy. Can withstand tds 300plus with baby shrimps. 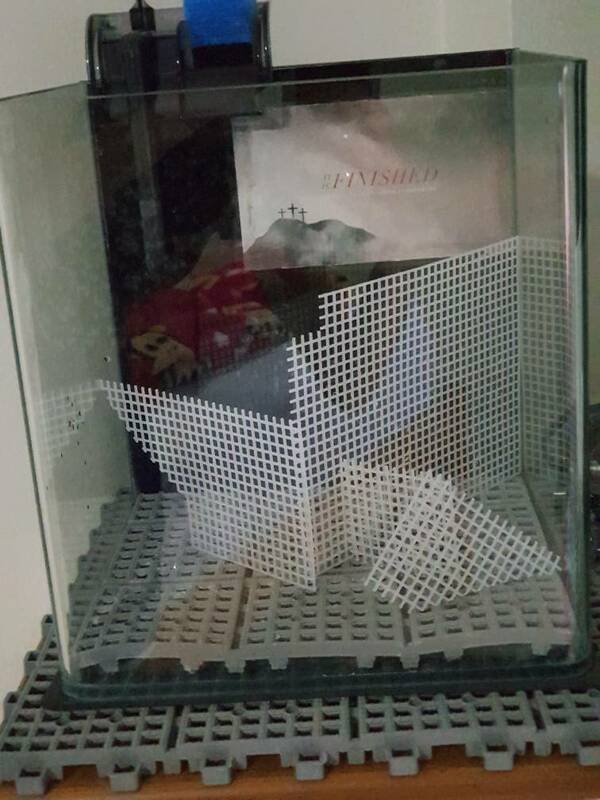 It was a tough project,though the tank was small but i think the toughest tanks to scape are the small ones which are cuboid shaped. Currently it is still cycling but i assume it will complete the cycle period sooner as i have added in used substrate and items from my main cycled tank which holds the fire reds and crystals. Hardscape: Black lava rocks, initial plan was dragon stones but that was omitted in the end. Good to see you back, I was wondering what was happening? You have a good eye as the tank looks great! Glad to hear the shrimps are still doing ok in the pail as well. 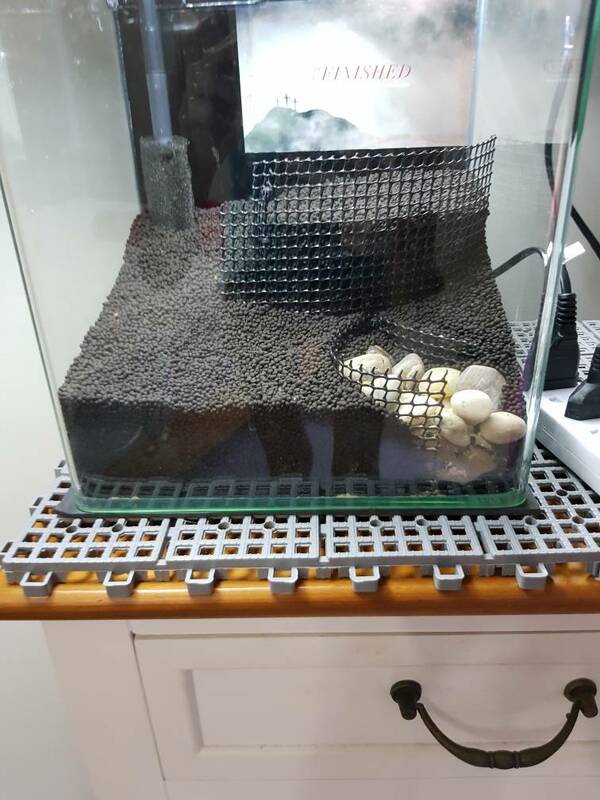 Did you measure the amount of water you pit in the tank, if it is a 10L TANK, I would guess about 6L with all the soil/rock etc? Not sure what the glass tube thing is on the right hand side? 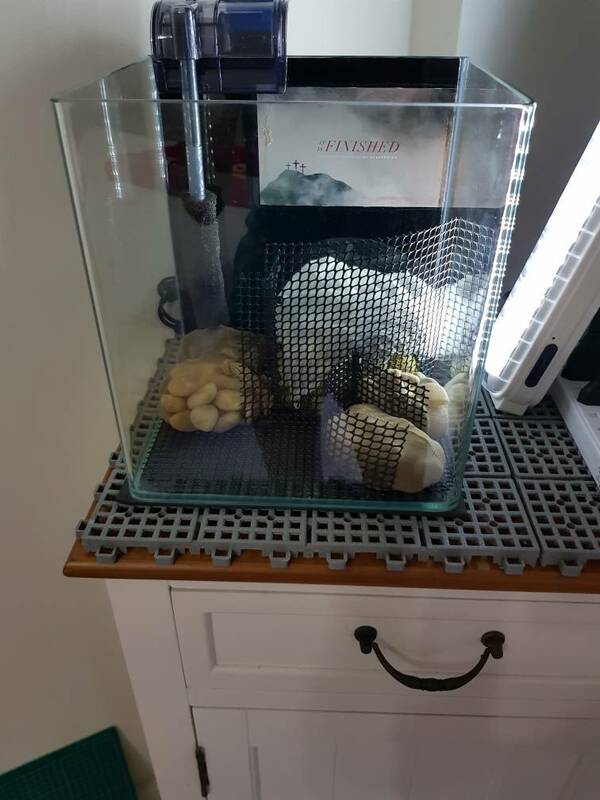 Do you have a clear lid/cover for the tank to reduce any evaporation? Do you know whether the cycle has started yet, ie any ammonia/nitrite/nitrate readings? Is it running similar water parameters as the pail the shrimps are in, I would guess they are neos as they are the hardier shrimps? Keep up the good work and I look forward to following the progress. Alot had happened on the week i was supposed to do the tank. Things did not go according to plan! Had plans to finish 2 tanks, one for the yellow neos another for the tetras. However just as i was starting to get things going, i noticed that the tetras were down with something! Looked to be fungal. Anyways that will be another thread in the correct department, better not rattle off here and go off topic again. Anyways back to the subject of this tank for the yellow neos. Yep i did manage to measure the amount of water in this tank. I topped it up to exactly 9litres, erm, it got to be really full, thankfully weather here was very warm so evaporation brought it down to a more comfortable level so im gonna say it can hold 7 to 8litres well. 9litres being too full. The glass contraption is a co2 diffuser. Im using neo co2, product is made in korea and its basically running like a diy co2 setup. Just that this comes with the solution mix, bottle, tubing and diffuser. All you need to do is to just mix warm water to the mix as per instruction and it will do the rest of the job for you. Yep this tank came with a glass lid, only thing it is not a full covering lid. The lid is only half the size of the top of the tank. 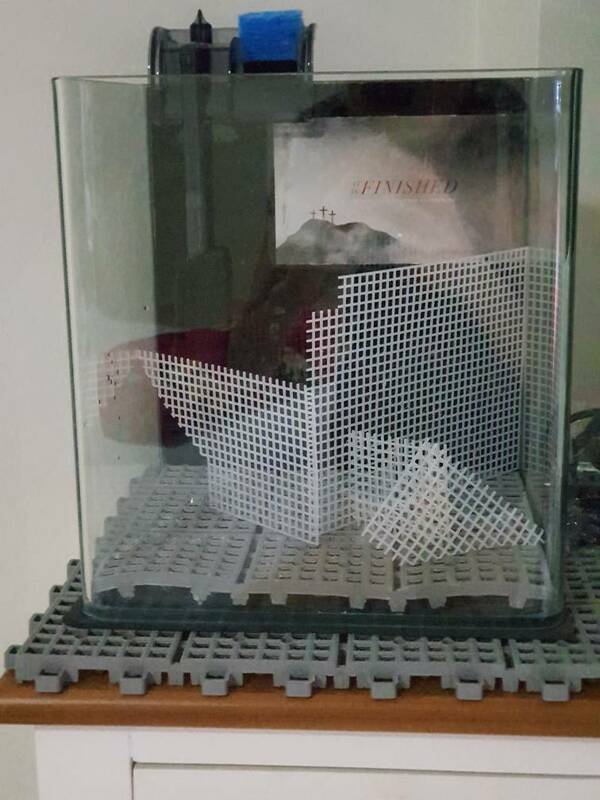 So you would only be able to cover half the tank. Now the technical bit. You beat me to it because i was going to ask if i can assume my tank HAS already started the process of cycling? Above readings were taken 3hours after water change. This reading was done 3 days after water change. Yep on the issue of the identity of these shrimps. I think we can just assume they are yellow neos, precisely what you said, they are so hardy! Did you measure the water capacity before you put anything in the tank, or after you had done the scaping? The rock/substrate etc uses up some of the capacity! 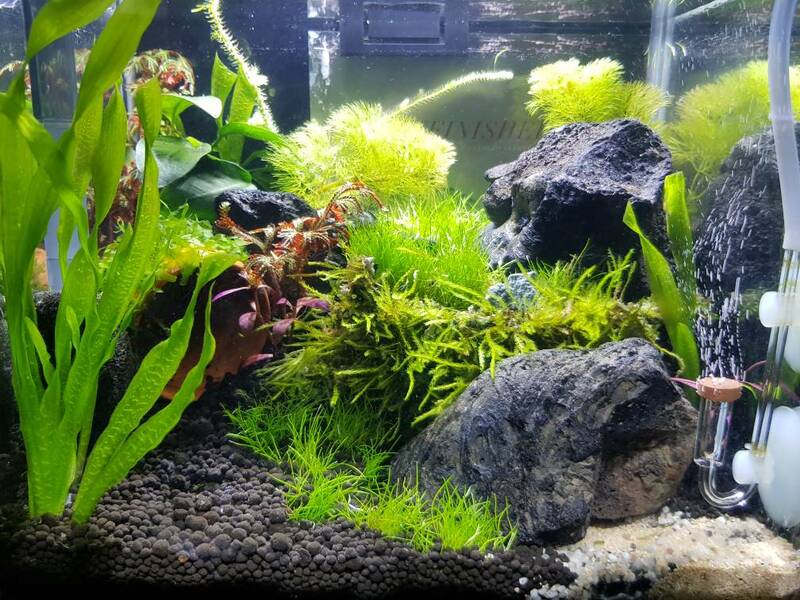 I have never used CO2 and I think it is usually only used for plants (aquascaping) so don't think you need that unless you need it for the plants - hopefully some one more experienced will let you know about that? It looks like there is a cycle going on but I have never actually 'SEEN' this myself so I am not too sure what stage you are at with it (I'm not being much help........) all I had with my tanks was a bacteria bloom for a couple of days, though I wasn't very good at checking in all truth - should have done more (daily) tests really at this stage. When the Ammonia and Nitrate/ite are the same as the ones in the pail you should be there I think as those look perfect. Aside from the TDS the other parameters also look very close so you should be ok there as well? I looked at the pictures of the shrimp and they looked orange to me, but maybe the pink pale made them look less yellow? Shouldn't be much longer before you can transfer the shrimp, always a relief as you will be able to see them better and can clear the pail away! ps I will leave the stone post you have done to others as although I have 'bits' of rock in my tanks I haven't had a problem and don't know about that! Yeah i as well there is a cycle going on looking at the results. What i understand from the ammonia cycle is first there is ammonia, than nitrite(stuff that will kill your fish) and than nitrate(stuff that your plants take in) so from the results i gather the ammonia is being broken down already but a cycled tank would mean the nitrite must be o. (From what i understand) else shrimps cannot go into that tank. The question for now is, do i bring this tank's tds up to 200plus to match the pail? And how do i do it? Cant seem to have high tds now that im using distilled water and not tap water. This 159 tds in the tank is after i have added all the mineral goodness and plant fertillizer into it. Or do i leave it and try to bring down pail tds further? The co2 is needed in this tank because of the hair grass that is growing in there. Quite impossible to get them to carpet nicely without co2 boost to the tank. Yeah the rock issue did tire me out, lady in the shop was quite fierce but im just glad it all got sorted. If it were me I would do 50% water change in the new tank using the water from the pail and that will take the water to TDS about 210 (or just over), all the other parameters are close so it won't change those and the pail water is already cycled/safe. 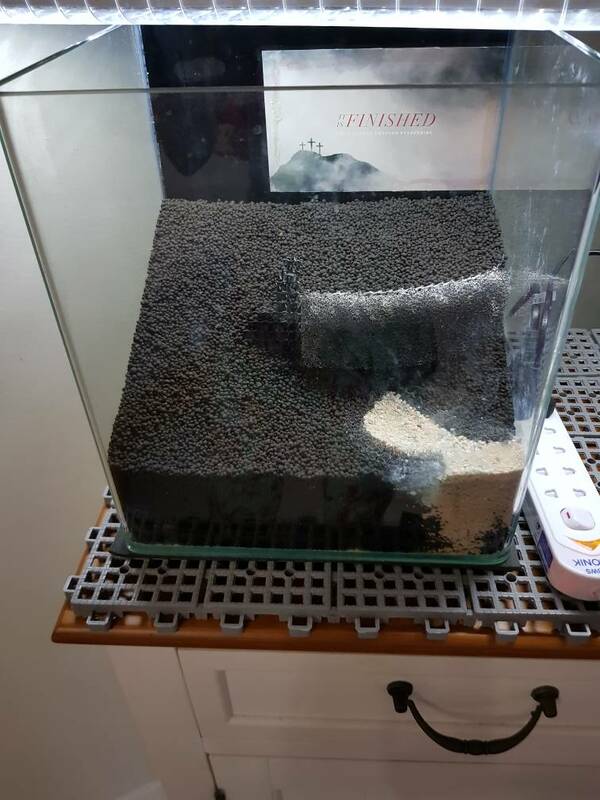 You will need to top up the pail using a dripper as the shrimps are in there but the water can go straight from the pail to the new tank as there are no critters in there. 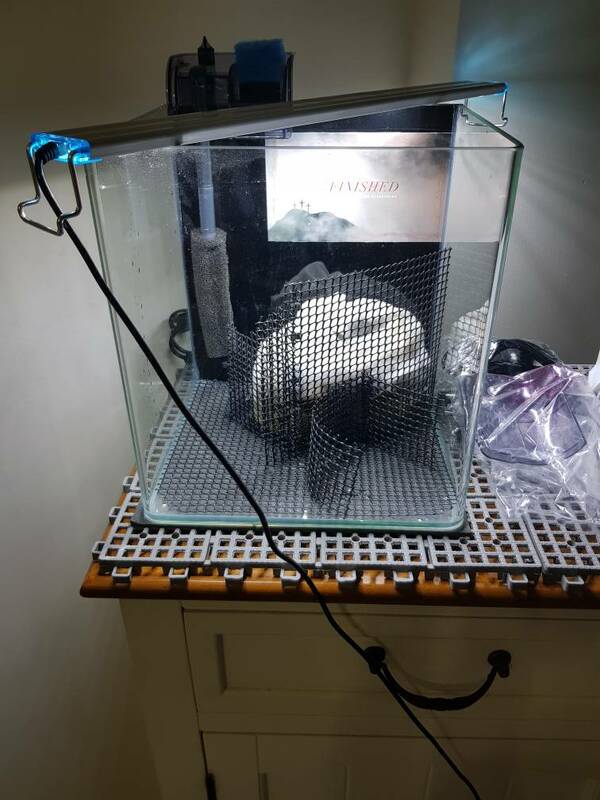 By the time the new tank is finished cycling as long as you do a slow drip acclimatising for the shrimp to the new tank water I doubt there should be any problems as the parameters should be close enough. You can try and bring the pail water down in TDS in the meantime as it probably needs more regular water changes anyway as there is mainly poo in there??? This is just what I would do so you may want to wait a few days and see if anyone more experienced than I comes back and says, no don't do that! It sounds like you understand the 'cycling' well enough? You will get a clearer idea of the shrimps colour once they are in their new tank. Just remember to (ex)change water with the distilled water and GH+, but use pure distilled water (no GH+) to top up after evaporation. I think you have the GH+ so that makes sense......... As the water is already KH4 you don't need to increase that, so no combined GH/KH+. a day or two after confirming that the tank is cycled (no ammonia and no nitrites), change 90-99% of the water. Refill with RO water (ideally), or distilled water in your case. Remineralise the water to the ideal parameters for your shrimp. Adjust pH, KH and GH. Wait for temps to stabilise and reach what you set, if you use a heater or chiller let it run until your temps get to your target. Measure one last time to ensure you are not detecting ammonia or nitrites. Now, pour out the water in your pail, leaving 2-3 litres (careful to not pour out your shrimp!). Drip the new tank water into the pail. The plan is to acclimatise the shrimp to the new tank water, which has hopefully been set to the ideal parameters. Drip in the same amount (2-3 litres) into the pail. The water in the pail will now be very close to the tank. You can retest the water in the pail to check how far off it is compared to your tank water. If you are happy, move the shrimp into the tank. Otherwise drip more water for a bit longer. You should go with JayC advice as he has much more knowledge than I, and it makes a lot of sense and is straight to the issue. 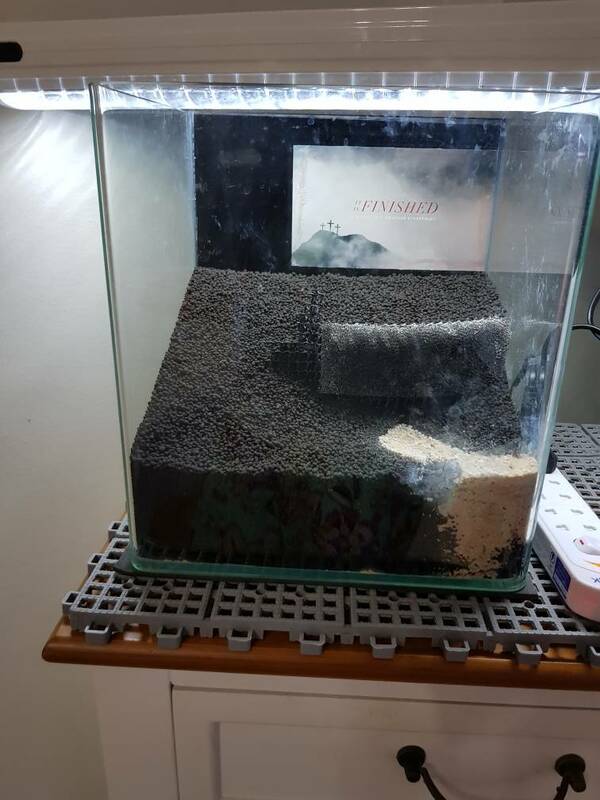 I am guessing that the pail water and the new tank were filled with 'tapwater' to start with, so changing most of the water before the shrimps go in (then remineralising) will give you a better starting point. 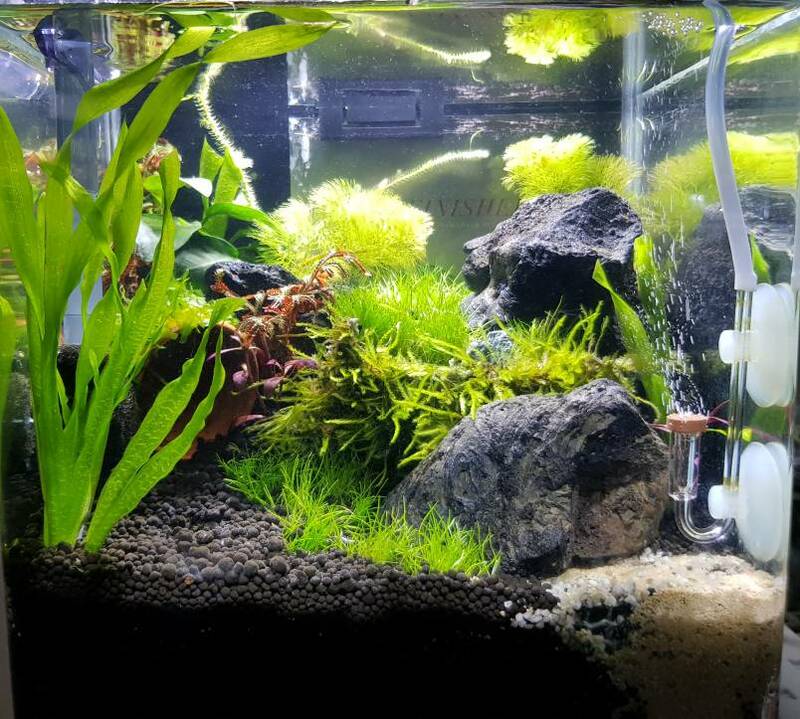 I did the same and used tap water to 'cycle' the tank, but next time I would do it all properly from the start so that less work/messing is necessary. I am assuming this as otherwise you should not have KH4 using distilled water with GH+ remineraliser? I think I recall you only use GH+ so far (not GH/KH+) correct me if I am wrong, so I am not sure what will happen using JayC above method as using distilled water (assuming that is TDS004, GH0, KH0) with GH+ (90% water change) may mean the KH will drop to 0. You may need to get some GH/KH+ (or a seperate singular KH+ product if available to use withthe GH+) for this tank if they are neos and living happily in KH4 already???? Is this safe to go from KH4 to KH0 in one jump for the shrimp anyone???? The GH/KH+ products probably add GH and KH at 2:1 rate? It is made more difficult that we don't know what the shrimp are of coarse so we are assuming they are probably neos, but it is what it is? Now, pour out the water in your pail, leaving 2-3 litres (careful to not pour out your shrimp!). Drip the new tank water into the pail. The plan in to acclimatise the shrimp to the new tank water, which has hopefully been set to the ideal parameters. Drip in the same amount (2-3 litres) into the pail. The water in the pail will now be very close to the tank. Thank you jayc for the step by step instructions. I will follow those steps in detail when i see nitrites reach 0. Will give an update on them in their new home. I used half distilled, half tap for this tank at the first fill of water. Did not have enough distilled, could this explain why kh is 4?? Will only know what happens when i do the 90% wc as jayc instructed at the time when i see nitrites reach 0. Yep i only use gh+, do not have a product for kh/gh+ because when i started out alot of hobbyist emphasized on gh mpre than kh. So i just thought it is not such an impt factor in shrimp keeping? I think kh has a role in ph levels. Something like the higher it is, the higher your ph. We could only hope for the best when we transfer the yellow neos in, since we do not know for sure what they are. I guess best bet is to mimic the conditions of the tank as close to the pail as best we can? Sounds like a plan? Thank you for the reminder to use distilled for water changes and top ups for this tank. I will be sure to remineralize it at wc and only pure distilled at top ups. Correction on my previous statement of half tap, half distilled. It is better tracking ammonia to determine when a tank has completed cycling. Often nitrites are undetectable, as it is converted faster to nitrate than ammonia to nitrite. Point is you could get a false sense of security. You have an ammonia kit right? Don't waste ro or distilled water when cycling a new tank. Tap water, dechlorinated is perfect for cycling tanks. Tap water has high KH and pH which is better for bacteria to multiply. Tap water has ammonia as food source for the bacteria. RO or distilled water is missing those and needs to be added for ideal bacterial growth. It's still possible but takes longer. Add 27 -28 deg C temps and a tank will cycle very quickly. That's why I said change 90 to 99 % of the water after the tank is cycled to reset to the parameters you want. Also monitor pH during the cycling. When pH drops below pH 7, do a 50% water change to get pH up again and to add more food (ammonia) for the growing bacteria. That's the real reason for a water change during tank cycling. Water change is not to remove ammonia, that just removes the food for the bacteria. Don't remove the food source needed for good bacterial growth! So water changes in a cycling tank is not needed until pH drops below 7. Bacterial growth is not as fast in acidic pH. Let pH drop to 5's or 6's, and bacteria growth will even stop or reverse. I'm typing on my phone on a moving train, so forgive the spelling mistakes and shortened sentences. Get some household cleaner ammonia (the one that is only ammonia and has no other added chemicals like surfactants) and purposely dose the tank until it has 1 ppm ammonia. A "fully cycled" tank will take that 1ppm ammonia and turn it into nothing but nitrates in about a day. Then do water change again to reduce nitrates. Once the shrimp are in, test the ammonia, nitrite, and nitrate every day for approx two weeks. Get a bottle of Seachem Prime ready in case the cycle "collapses" and you start to see ammonia and nitrite again. If it does collapse, you will have to re-dose the tank with one of those bacteria in a bottle products like Seachem stability, tetra safestart, etc. Thats very interesting that you recommend using tap water to cycle. I had assumed I had done this as a mistake but the way you have explained it and set out a process makes sense and would have made it easier for me, so I will try and remember this for the future. The only aspect of this is I am unsure about (and I guess I don't need to know personally as our water doesn't have a high KH anyway) is the KH? From that video we watched the shrimps should be ok in KH1-4, they are in KH4 at the moment (and doing well I assume) so you (Jojo) will need to do something to get the KH up (I assume) from the 0-1 it will be with distilled water and GH+. I think there is a product out there which only adjusts the KH, or there is the combined GH/KH products instead of the GH+ you already have?? I don't know (but assume) it isn't good to take them from KH4 straight into KH0-1(even if every other parameter is matched) but someone else may know whether that would be ok?? Maybe it is ok?? Hopefully you can get them into their new tank soon so that you can get rid of the pail and relax and enjoy watching them. I remember closing down my small tank that was in the way on the table as it was temporary and was such a relief to get it packed away etc. I look forward to seeing a picture of them in the new tank in the future. Thank you again for the in depth lesson. I now understand the theories behind doing certain things during the cycling stage. Typically the water changes during this stage. Yes i have an ammonia kit, will track the progress and the ph level as you have mentioned and time the water change as required. Noted on using tap water first as well. Distilled will come in later on at cycled status. Hope you did not fall on the moving train, appreciate you took the trouble to enlighten me. Oh wow, you are going for it in a big way, but once you have all the equipment it will make life easier in the long term and you won't need to keep faffing about with different waters. As the chap said on that video (watched it again last night, it is very good) even neos do better in remineralised RO water than tap water anyway. It also covered the different 'salty shrimp' remineralisers, ie GH+ for caridina, GH/KH+ neos, and another for sulwasi. I had a quick look on my suppliers website and saw this so there is a product 'out there' that just does KH and expect you can get that from somewhere locally if you WANT to go that route, but it will probably be harder to get hold of than the GH/KH+ route (and can only see the 1 type), and the GH/KH+ route is easier anyway but it means you will be left with the GH+, though you probably still use that in the crystal shrimp tank so won't be a complete waste?? You may be right anyway that the KH isn't important so maybe wait and see if someone comes back with that info at this stage? If you need to raise KH for Neos, the economical way is to use Bicard Soda (not baking powder, however which has an extra raising agent for baking cakes). it is much cheaper and does the same. You might already have that in your kitchen. As with anything that changes your water parameters, make the change slowly if you have shrimp or fish already in the tank. You can make the change faster if there are no livestock in the tank. When you are confident enough, have a read of my "DIY remineralisation for RO or rain water" thread in Water Parameters subforum. You can start making your own salty shrimp in bulk for a lot less. Just make sure that one of those stages is NOT an alkalising stage. RO water is acidic by default since it is stripped of all salts and minerals. If the RO filter has an alkalising stage, it raises alkalinity (obviously, duh). It does that to make the water drinkable for humans. Pure RO water is Acidic and is not good for drinking. That acidic RO water will rot your teeth for one. So make sure your unit, if it has an alkalising stage, can be bypassed or turned off when you use it for aquariums. My RO unit has this alkalising stage, but has a "tap" to turn it off. See that "Alkaline cartridge" at the bottom, it has a tap to the right that allows RO water to bypass the alkalising stage. Turn it on for drinking water. Turn it off for aquarium water. Actually, you could probably use the alkaline cartridge for Neos to raise the KH and pH. But check test it to ensure it is within the parameters for Neos. Simon, thanks for the link will have a look at later. 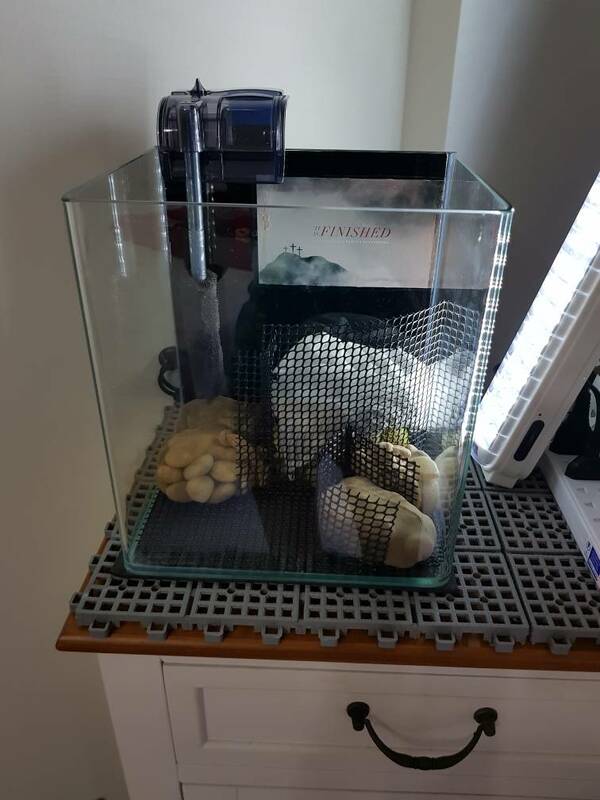 Culling your shrimps and cant decide? How about just leaving them in there for the moment? Jayc, i will also have a look at your thread on remineralizing to educate myself deeper. Thank you. Thats one serious looking unit, I will stick with my zerowater Jug I think. Hopefully JayC may be able to see if your unit has the tap he talks about. I have chickened out of culling for today (well all this week actually) as I can't see any I want to cull. The only reason for culling some (23 todate) is so I don't get over-run, got loads of babies so must be over 100 shrimps in the tank at the moment? I don't want anything to go wrong due to too many shrimps and have enough room/biofilm etc for the babies that come along. I think I will put spinach in the tank tomorrow and that should bring them ALL out so will pick a couple then - well that's the theory/plan anyway! Wow! That is alot of babies you have! Well, good job it surely means you are doing things right! Hope that encourages you! Yep i guess if you are not in the mood to do it than another day would be better, sometimes it requires looking intently at them for a good while to see their true potential, quite a painstaking process! Guess when i get there with as many babies as you, i would need to ask how you do it because culling is another area new to me! Do you have this brand (borneo wild) in uk? I just bought the bio film conditioner, i think it is quite a good product. Like feeding your shrimps but its clean feeding i suppose? Dont know how to word it but its essentially bacteria and not food but will become micro food when left in the tank? Works great especially for a tank run over with babies like yours. It was much easier to pick ones I didn't particularly like at the beginning, but the longer I do it the less 'unattractive' (they are all the attractive ones left now) but I am determined to get a couple to cull tomorrow, then that can be it for this year I think!!!!!!!! There are quite a few babies that are nothing special but I don't think you can rely on there colour/pattern at that stage, and anyway difficult to catch them at 2mm in size. Still, nothing you should even need to think about at the stage you are at, be a while yet. @sdlTBfanUK, start selling the extra shrimp either to your local fish shop or to fellow SKF members by advertising in this forum. Yes agree with jayc, start selling them! Good luck picking out shrimps today! I don't know of any 'local' fish shops that sell shrimps either as UK is so small mist people seem to be hobbyists selling through the post (thats where mine came from) and I think if they have tried selling through shops it is more hassle than it is worth as they are so delicate that unless you REALLY know what you are doing (and just seeing/wanting them in a fish shop whilst you are there already isn't enough as we have all found out) they won't survive. Many years ago there was a shop about 10 miles from here but they gave up selling them as too many people were bringing back dead ones the next day etc. At least with internet ones you are more likely to be looking for them specifically and therefore know what you are doing. I haven't ever had one die in transit to my home, but USA and Australia are a hell of a lot bigger so 'next day delivery' may not work out there!